In a no-wind condition, the pilot can perform a ground-based constant radius turn by accurately maintaining a constant bank angle throughout the turn; however, with any wind the complexities of maintaining a ground-based constant radius turn increase. 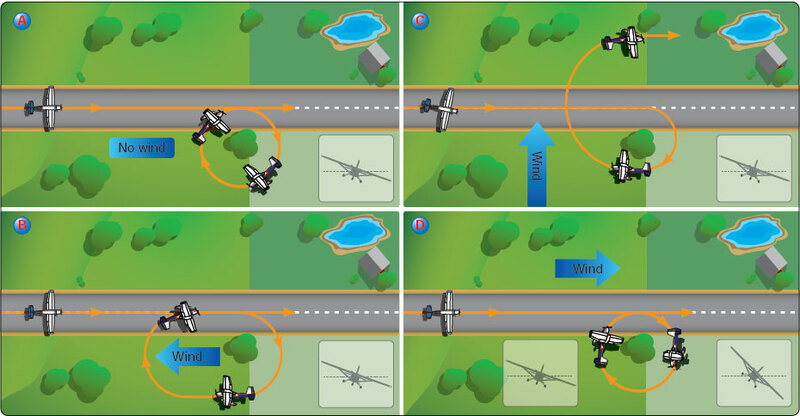 When wind is present, during ground reference maneuvers involving turns, the pilot must correct for wind drift. [Figure 6-2] Throughout the turn, the wind is acting on the airplane from a constantly changing angle—increasing or decreasing the groundspeed in a manner similar to straight flight. To follow a circular, constant radius ground track, the bank angle must vary to compensate for wind drift throughout the turn. The airplane’s ground-based turn radius is affected by the airplane’s groundspeed: the faster the groundspeed, the steeper the airplane must be banked to maintain a groundbased constant radius turn. The converse is also true: the slower the groundspeed, the shallower the airplane needs to be banked to maintain a ground-based constant radius turn. For a given true airspeed, the radius of turn in the air varies proportionally with the bank angle. To maintain the constant radius over the ground, the bank angle is proportional to ground speed. For example, an airplane is in the downwind position at 100 knots groundspeed. In this example, the wind is 10 knots, meaning that the airplane is at an airspeed of 90 knots (for this discussion, we ignore true, calibrated, and indicate airspeed and assume that they are all the same). If the pilot starts a downwind turn with a 45° “steepest” bank angle, the turn radius is approximately 890 feet. Let’s assume the airplane is now upwind with a groundspeed of 80 knots. In order to maintain the 890-foot radius, the pilot must reduce the bank angle to a shallowest bank of approximately 33°. In another example, if the downwind is flown at an airspeed of 90 knots in a 10 knot tailwind with a desired turn radius of 2,000 feet, the “steepest” bank angle needs to be at approximately 24° and the upwind “shallowest” bank angle at approximately 16°. 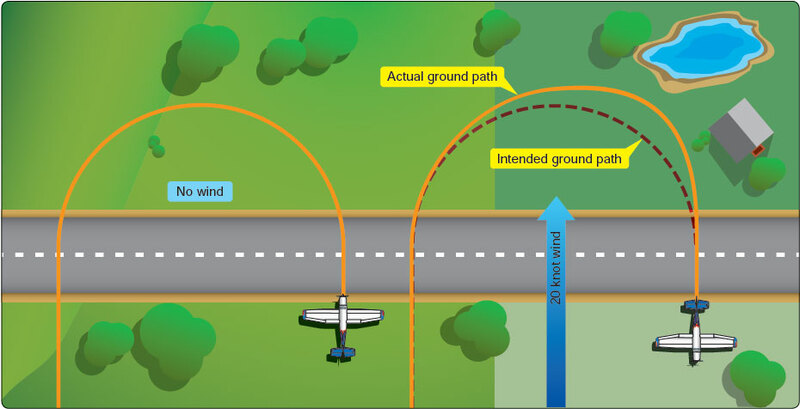 To demonstrate the effect that wind has on turns, the pilot should select a straight-line ground reference, such as a road or railroad track. [Figure 6-3] Choosing a straight-line ground reference that is parallel to the wind, the airplane would be flown into the wind and directly over the selected straight-line ground reference. Once a straight-line ground reference is established, the pilot makes a 360° constant medium banked turn. As the airplane completes the 360° turn, it should return directly over the straight-line ground reference but downwind from the starting point. Choosing a straight-line ground reference that has a crosswind, and using the same 360° constant medium-banked turn, demonstrates how the airplane drifts away from the reference even as the pilot holds a constant bank angle. In both examples, the path over the ground is an elongated circle, although in reference to the air, the airplane flew a perfect continuous radius. In order to compensate for the elongated, somewhat circular path over the ground, the pilot must adjust the bank angle as the groundspeed changes throughout the turn. Where groundspeed is the fastest, such as when the airplane is headed downwind, the turn bank angle must be steepest; where groundspeed is the slowest, such as when the airplane is headed upwind, the turn bank angle must be shallow. It is necessary to increase or decrease the angle of bank, which increases or decreases the rate of turn, to achieve the desired constant radius track over the ground. Ground reference maneuvers should always be entered from a downwind position. This allows the pilot to establish the steepest bank angle required to maintain a constant radius ground track. If the bank is too steep, the pilot should immediately exit the maneuver and re-establish a lateral position that is further from the ground reference. The pilot should avoid bank angles in excess of 45°due to the increased stalling speed. The pilot should first be introduced to ground reference maneuvers by correcting for the effects of a crosswind over a straight-line ground reference, such as road or railroad tracks. If a straight road or railroad track is unavailable, the pilot will choose multiple references (three minimum) which, when an imaginary visual reference line is extended, represents a straight line. The reference should be suitably long so the pilot has sufficient time to understand the concepts of wind correction and practice the maneuver. Initially, the maneuver should be flown directly over the ground reference with the pilot angling the airplane’s longitudinal axis into the wind sufficiently such as to cancel the effect of drift. The pilot should scan between far ahead and close to the airplane to practice tracking multiple references. When proficiency has been demonstrated by flying directly over the ground reference line, the pilot should then practice flying a straight parallel path that is offset from the ground reference. The offset parallel path should not be more than three-fourths of a mile from the reference line. The maneuver should be flown offset from the ground references with the pilot angling the airplane’s longitudinal axis into the wind sufficiently to cancel the effect of drift while maintaining a parallel track.